Blu-ray review: "Zero Dark Thirty"
Jessica Chastain is as important to Zero Dark Thirty as Daniel Day Lewis is to Lincoln. After winning the Academy Award for The Hurt Locker¸ producer/director Kathryn Bigelow and producer/screenwriter Mark Boal teamed up again for this unflinching look at the pursuit of the most wanted fugitive in the world. Zero Dark Thirty focuses on the work of a diligent team of specialists whose job was to uncover terrorist plots and prevent them from coming to fruition. More importantly, they were the behind the scenes men and women who dug out information about Osama bin Laden and ultimately uncovered his whereabouts. As the film details, it was one woman – named Maya in Zero Dark Thirty – who saw it has her calling to bring bin Laden to justice. Maya is portrayed by Jessica Chastain, quickly becoming one of this generation’s most accomplished actresses. In a few short years she has worked with Malick, brought much grace to The Help, and grounded the unbelievable in the horror film, Mama. However, it’s her work in Zero Dark Thirty that people will look back on as the film that put her a notch above most other performers. Through Maya (and Chastain’s) eyes, we are thrust into the murky world of “enhanced interrogation,” equally repulsed by the lack of humanity prisoners were shown. Yet, as she becomes more entrenched in the war on terror, Maya begins to change. She becomes cynical and just as willing to use torture as a means to get information. By the time the film has ended and (no spoiler here) bin Laden’s body lays in a body bag, we have been through hell with Maya and are just as relieved as she is that her pursuit has come to and end. Maya is a hero for what she has done, but she is tortured and flawed and who knows if she’ll ever be the same. Zero Dark Thirty could have been a dry, by the numbers film that ended with a big shoot out. However, Boal and Bigelow have crafted a movie just as thrilling and entertaining as Ben Affleck’s Argo. Unlike that film, though, Zero Dark Thirty’s characters tread into a grayer area of right and wrong, which may explain why the film became a political hot button after its release. Politicians demonized the film, calling its depiction of torture inaccurate and calling for investigations into the film’s sources. I have no doubt that the political rhetoric attacking the film hurt its chances for any of the major awards it deserved. This is a shame because Boal’s screenplay and Bigelow’s direction were even handed and some of the best filmmaking of 2012. A bigger shame is that Chastain was denied the Best Actress award at the most recent Academy Awards. Don’t get me wrong, I adore Jennifer Lawrence and her performance in Silver Linings Handbook (perhaps my favorite film from last year), but Chastain’s acting in Zero Dark Thirty is on another level. She’s as important to Zero Dark Thirty as Daniel Day Lewis is to Lincoln. In other words, there is no movie without her. Surrounded by a strong supporting cast that includes Jason Clarke, Kyle Chandler, Jennifer Ehle, James Gandolfini, Joel Edgerton and Chris Pratt, Chastain carries the film on her shoulders. Even during the movie’s final raid sequence, when Maya sits by and anxiously awaits the return of the SEAL team that raided bin Laden’s compound, her presence is felt. If we hadn’t been fascinated by Chastain for two hours, that mission would be just another action sequence. Zero Dark Thirty could have easily been a dry, documentation of the facts, especially since so much time is spend in front of computers, in board rooms and hallways, and just talking to people. However, through Bigelow’s smart direction, I was reminded of All the President’s Men, another tense, thrilling drama about the pursuit of information. 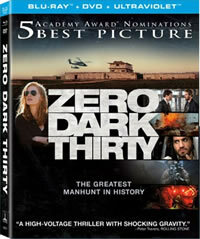 Will we still be talking about Zero Dark Thirty 40 years from now? I believe we will. Lefschmutz: Bob Lefsetz Wants His Airline Peanuts!